This program is designed for staff who must understand the intricacies of the regulatory process. 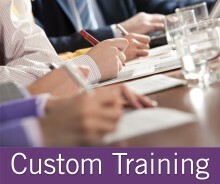 Learn strategies and tactics to influence or check the exercise of regulatory power. Get a usable framework for the regulatory process and a better understanding of the rulemaking process from beginning to end. Agencies of the Executive Branch may take a variety of administrative actions. Administrative Procedure Act - Reasons for adoption and basic structure. Expansion of Federal regulatory power in the 1960s and 1970s. Checking reactions to Federal agency exercise of new regulatory powers. How agencies develop notices of proposed and final rulemaking. Legislative-type hearing is the norm. Facilitated and Interactive Workshops are optional. Schedule additional public hearings outside of Washington. Re-propose or publish notice reopening or extending the comment period. Initiate or acquiesce in one-time informal meetings with vocal constituency. Final regulation must be a "logical outgrowth" of the proposal. Preamble must respond to the relevant, "major issues" synthesized from the public comments. Preamble must reflect final NEPA, Paperwork Reduction Act, and Regulatory Flexibility Act. Action Memorandum and Concurrence Process (same as for proposed rule). OMB Clearance Under Executive Order 12866. 45 percent of reversals of final rules attributable to failure to explain basis for agency action or rejection of major comments in the preamble to the final rule. 20 percent of reversals of final rules attributable to erroneous statutory interpretations. 20 percent of reversals of final rules attributable to purely procedural error. Rulemaking is a system of procedures to channel and check the exercise of the power to make enforceable policy. The agency is obliged to involve the public and to respond to public input. Usually the agency has to balance different viewpoints and arrive at a policy that can command public support. Ultimately, the agency is subject to supervision by OMB and is accountable to the courts and to Congress. Audience Level All staff who need an overview of administrative and regulatory process. Audience Size This program is most effective for between 20 and 35 attendees. 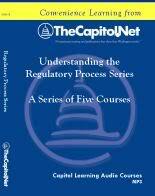 Buy all five (5) Capitol Learning Audio Courses on audio CD. Total run time: 319 minutes on audio CD (includes MP3 audio files and course materials in PDF on CD). Includes FREE copy of Federal Regulatory Process Poster (regularly $25) plus FREE shipping in the US. "I just picked up regulatory monitoring and it's so different from legislative activity that anyone would be foolish not to gather as much information as possible and on a continuous basis." "The seminar has given me a number of ideas of actions I can take to improve my organization's interaction with federal agencies during the rulemaking process." Our faculty for this program are all experts with more than 10 years' experience working in or with regulatory agencies.